Fast. Easy. Affordable. Delicious Recipes. I recently went grocery shopping at a “new to me, again” store called Aldi. Aldi has been in my area for well over 15 years. If you have spent any time reading my blog, you are well aware that I am very fond of grocery stores. I love discovering new stores and the “new to me” products that they carry. I shopped at Aldi occasionally when my kids still lived at home but I haven’t stopped at an Aldi Store for some time. A few days ago, I drove past an Aldi and thought I’d stop in. The Aldi store I stopped at was in Shawano WI. The store was very clean and the people working there were very friendly. I actually bought more than I had expected to! I had a cart full of groceries. Many items that Aldi carries are German products and Aldi brand name products. Aldi carries some name brand products as well. They carry a nice variety of products and among the many products I purchased, was this package of; Spinach and Ricotta Stuffed Spinach Rigatoni. We love lasagna so I went with that. Using the spinach & ricotta stuffed rigatoni to replace the lasagna noodles made for a hearty and delicious lasagna. I’ve used stuffed ravioli before in place of the lasagna noodles so I thought, why not use the stuffed rigatoni! 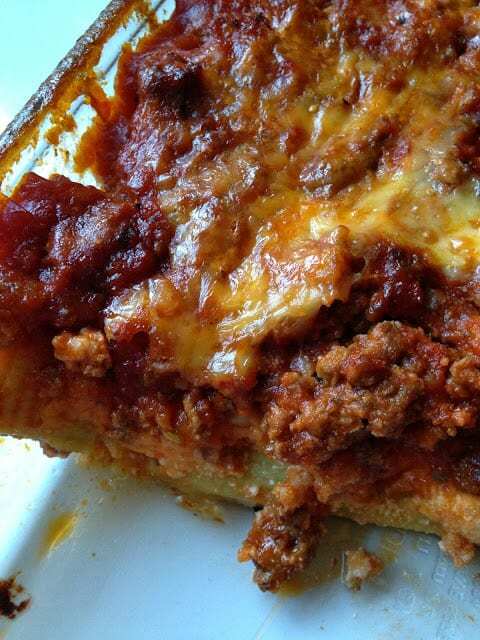 Serve stuffed rigatoni lasagna tonight for dinner with garlic bread, garden salad and glasses of Chianti. For dessert serve dishes of Lemon Gelato for an added treat. Heat 2 tablespoons oil in large skillet over medium heat. Add minced garlic and cook 5 minutes. Add ground beef and sausage. Sprinkle with seasoning blend. Brown meat until no longer pink. Drain. Stir in spaghetti sauce. Heat until bubbly. Remove from heat. Set aside. Fill a large kettle with water, add 1 tablespoon salt. Bring water to a boil. Add frozen rigatoni and boil for 5 minutes or until rigatoni rise to the top. Drain. Cool slightly. In a 3 1/2 quart baking dish, spread a third of the spaghetti sauce, half of the rigatoni, 1/2 container ricotta cheese and 1 cup mozzarella cheese. 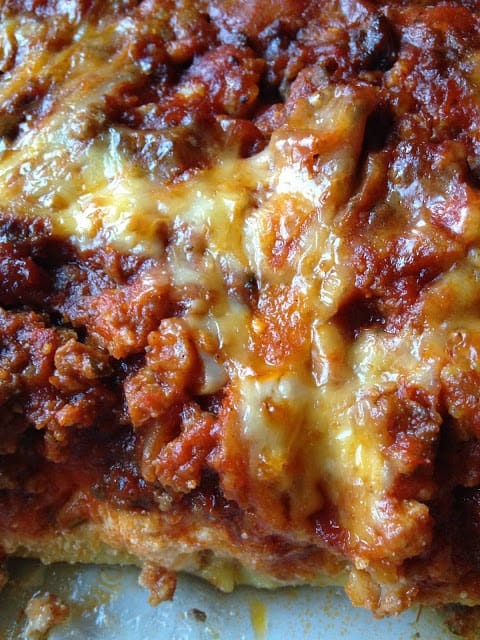 Repeat layers, ending with remaining meat sauce and 1/2 cup cheese. Cover with foil and bake for 45 minutes. Remove foil and bake 15 minutes longer or until bubbly and cheese is melted. Let stand 10 minutes before serving. *The views stated here are my own. I have not been asked or compensated from Aldi. 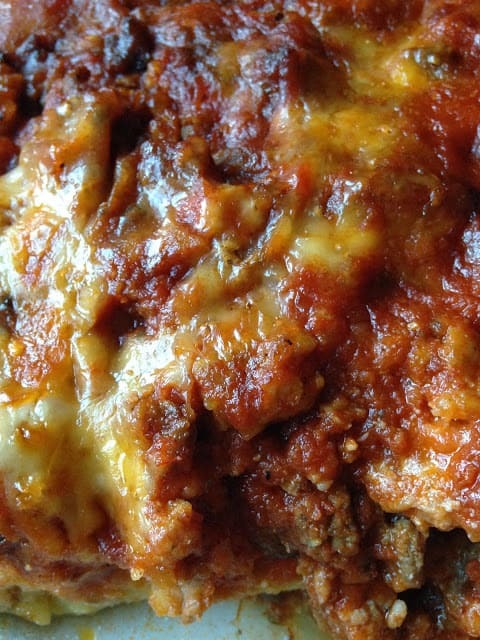 Hi Lynn, your lasagna look awesome. Thanks for sharing your wonderful recipe. This dish sounds so delicious and I love cooking Italian food for my family. TFS and have a nice day. Good Afternoon Lynn, We have Aldi shops here in England, they were always frowned upon because the shelves were not stacked very well, but nowadays because of the economic condition here in England, they are doing very well. I have always liked Aldi because I used to live in Germany and it was lovely buying all the German ingredients here in England. As long as the shop is clean, I really don't mind how the shelves are stacked. 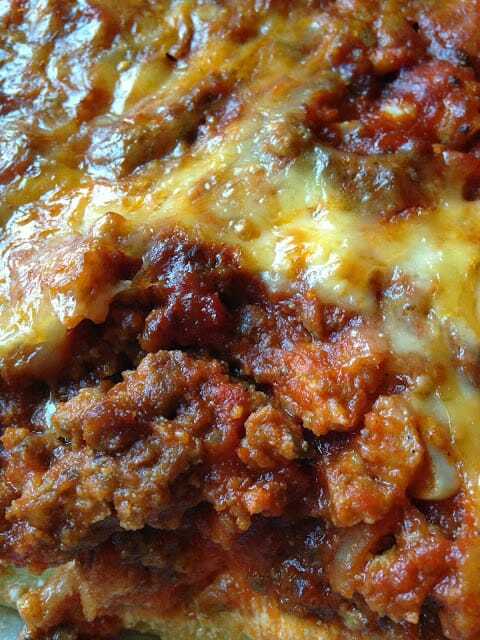 I have to tell you Lynn, your stuffed rigatoni lasagne looks delicious. Copyright ©2019, Turnips 2 Tangerines. All Rights Reserved.